We study T-branes on compact Kähler surfaces, in the presence of fields localised at curves. If such fields are treated as defects, their vevs induce delta-function sources for the 7-brane background, possibly leading to profiles with poles. We find that the presence of defect sources relaxes the constraints on globally well-defined T-brane configurations, avoiding the obstruction to building them on surfaces of positive curvature. Profiles with poles can be understood, from a 4d viewpoint, as non-trivial vevs for massive modes induced by the defects, and come with their own set of constraints. In the special case of fields localised on a self-intersection curve, we show how to retrieve the Hitchin system with defects from an ordinary global one with enhanced symmetry. L.E. Ibáñez and A.M. Uranga, String Theory and Particle Physics. An Introduction to String Phenomenology, Cambridge University Press (2012) [INSPIRE]. 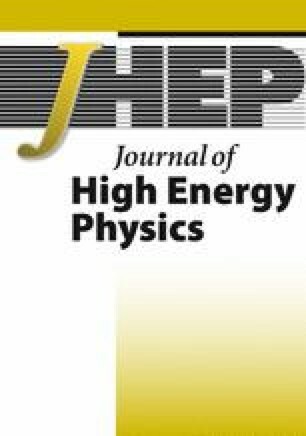 A. Maharana and E. Palti, Models of Particle Physics from Type IIB String Theory and F-theory: A Review, Int. J. Mod. Phys. A 28 (2013) 1330005 [arXiv:1212.0555] [INSPIRE]. T. Weigand, TASI Lectures on F-theory, arXiv:1806.01854 [INSPIRE]. C. Beasley, J.J. Heckman and C. Vafa, GUTs and Exceptional Branes in F-theory — I, JHEP 01 (2009) 058 [arXiv:0802.3391] [INSPIRE]. C. Beasley, J.J. Heckman and C. Vafa, GUTs and Exceptional Branes in F-theory — II: Experimental Predictions, JHEP 01 (2009) 059 [arXiv:0806.0102] [INSPIRE]. M. Cicoli, F. Quevedo and R. Valandro, de Sitter from T-branes, JHEP 03 (2016) 141 [arXiv:1512.04558] [INSPIRE]. A. Font, F. Marchesano, D. Regalado and G. Zoccarato, Up-type quark masses in SU(5) F-theory models, JHEP 11 (2013) 125 [arXiv:1307.8089] [INSPIRE]. M. Del Zotto, J.J. Heckman, A. Tomasiello and C. Vafa, 6d Conformal Matter, JHEP 02 (2015) 054 [arXiv:1407.6359] [INSPIRE]. F. Marchesano, D. Regalado and G. Zoccarato, Yukawa hierarchies at the point of E 8 in F-theory, JHEP 04 (2015) 179 [arXiv:1503.02683] [INSPIRE]. J.J. Heckman, T. Rudelius and A. Tomasiello, 6D RG Flows and Nilpotent Hierarchies, JHEP 07 (2016) 082 [arXiv:1601.04078] [INSPIRE]. A. Collinucci, S. Giacomelli, R. Savelli and R. Valandro, T-branes through 3d mirror symmetry, JHEP 07 (2016) 093 [arXiv:1603.00062] [INSPIRE]. I. Bena, J. Blabäck, R. Minasian and R. Savelli, There and back again: A T-brane’s tale, JHEP 11 (2016) 179 [arXiv:1608.01221] [INSPIRE]. F. Marchesano and S. Schwieger, T-branes and α ′ -corrections, JHEP 11 (2016) 123 [arXiv:1609.02799] [INSPIRE]. N. Mekareeya, T. Rudelius and A. Tomasiello, T-branes, Anomalies and Moduli Spaces in 6D SCFTs, JHEP 10 (2017) 158 [arXiv:1612.06399] [INSPIRE]. J.M. Ashfaque, Monodromic T-Branes And The SO(10)GUT , arXiv:1701.05896 [INSPIRE]. F. Apruzzi, J.J. Heckman, D.R. Morrison and L. Tizzano, 4D Gauge Theories with Conformal Matter, JHEP 09 (2018) 088 [arXiv:1803.00582] [INSPIRE]. J.J. Heckman, T. Rudelius and A. Tomasiello, Fission, Fusion and 6D RG Flows, JHEP 02 (2019) 167 [arXiv:1807.10274] [INSPIRE]. F. Apruzzi, F. Hassler, J.J. Heckman and T.B. Rochais, Nilpotent Networks and 4D RG Flows, arXiv:1808.10439 [INSPIRE]. D. Gaiotto, G.W. Moore and A. Neitzke, Wall-crossing, Hitchin Systems and the WKB Approximation, arXiv:0907.3987 [INSPIRE]. S. Cecotti, M.C.N. Cheng, J.J. Heckman and C. Vafa, Yukawa Couplings in F-theory and Non-Commutative Geometry, arXiv:0910.0477 [INSPIRE]. H. Hayashi, T. Kawano, Y. Tsuchiya and T. Watari, More on Dimension-4 Proton Decay Problem in F-theory — Spectral Surface, Discriminant Locus and Monodromy, Nucl. Phys. B 840 (2010) 304 [arXiv:1004.3870] [INSPIRE]. R. Blumenhagen, V. Braun, T.W. Grimm and T. Weigand, GUTs in Type IIB Orientifold Compactifications, Nucl. Phys. B 815 (2009) 1 [arXiv:0811.2936] [INSPIRE]. A. Font, L.E. Ibáñez, F. Marchesano and D. Regalado, Non-perturbative effects and Yukawa hierarchies in F-theory SU(5) Unification, JHEP 03 (2013) 140 [Erratum ibid. 07 (2013) 036] [arXiv:1211.6529] [INSPIRE]. R. Minasian and A. Tomasiello, Variations on stability, Nucl. Phys. B 631 (2002) 43 [hep-th/0104041] [INSPIRE].